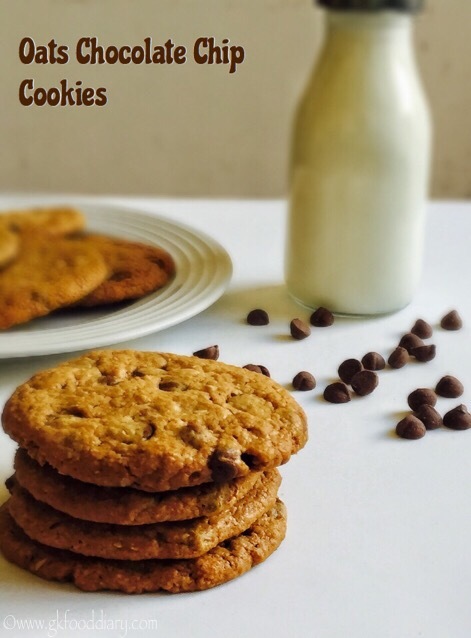 Oats Chocolate Chip Cookies- easy and healthy cookie recipe made with oats/oats flour, wheat flour and chocolate chips! Yayyy finally I have tried my hands on cookies, happened to see this delicious cookie recipe in a magazine and tried. 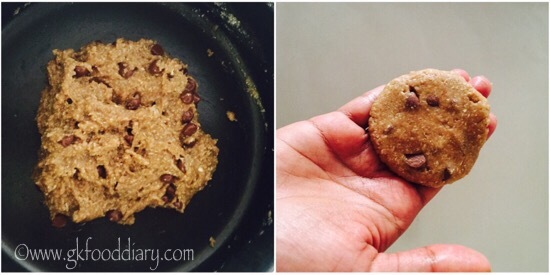 I was feeling so content after making this oats cookies as I got perfect cookies even though its my first attempt. My little daughter loved this cookies so much and asked if I can make it often! 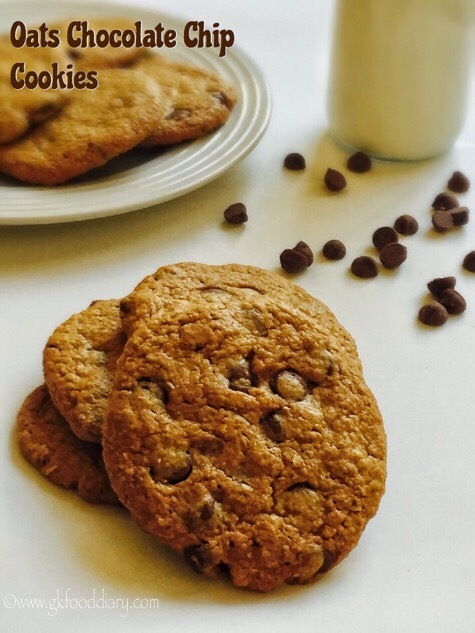 This oats chocolate chip cookies are healthy compared to store bought biscuits and can be given to toddlers after one year. Check some more healthy cake and muffin recipes for Toddlers and Kids here. 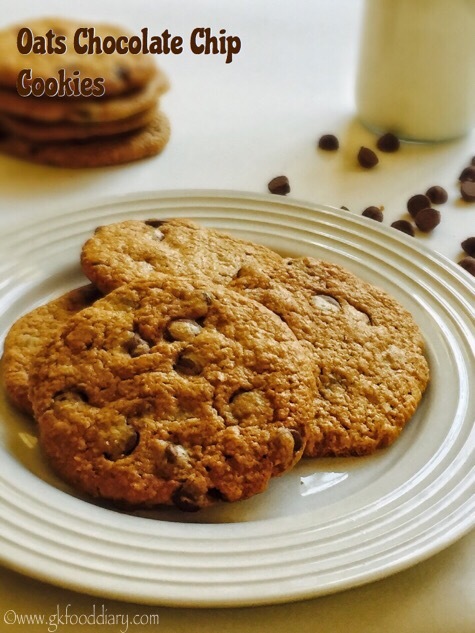 Now Let’s get on to check how to make this easy oats chocolate cookies. Measure and keep all ingredients ready. Also preheat the oven to 180 degrees C for 10 minutes. 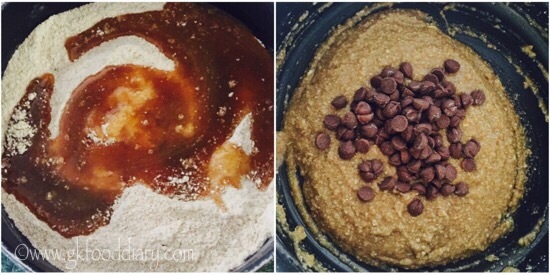 Take ¾ cup of oats in a blender and grind it to a slightly coarse powder. 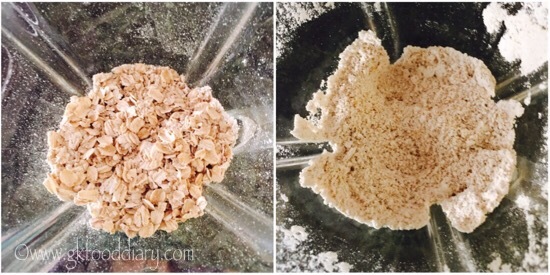 In a mixing bowl, take the grounded oats flour and add ¼ cup of wheat flour, salt and baking soda to it. Mix well. Then take the butter in a vessel and melt it. Once the butter is melted, add vanilla essence. Give a quick stir. Then add brown sugar to it. 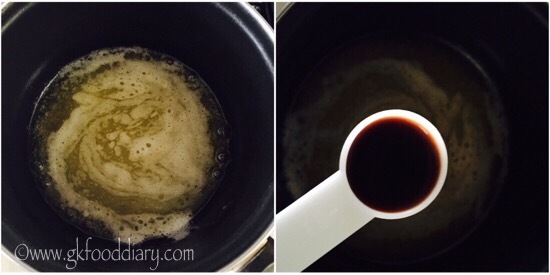 Mix well until the sugar is completely melted. Now add the boiled milk and mix it once again. Add this butter sugar mix to the dry ingredients and start to knead the dough with your hands gently. Add chocolate chips and 1 tbsp of wheat flour and continue kneading until you get the sticky dough consistency. Once the sticky dough consistency is reached, keep the cookie dough in refrigerator for 10 mins. In the meantime,line the cookie tray with cookie sheet/parchment paper. After 10 mins, take the cookie dough from the refrigerator and start making balls and flatten it using your palms. Arrange the cookies and bake in the preheated oven for 25 -30 minutes (baking time depends on the size of the cookies and oven) at 180° C till cookies are browned at the bottom. Allow to cool in tray for 5 minutes until cool down completely and serve the cookies. 1. Measure and keep all ingredients ready. Also preheat the oven to 180 deg C for 10 minutes. Take 3/4 cup of oats in a blender and grind it to a slightly coarse powder. If using whole oats for making cookies, skip this step. 2. 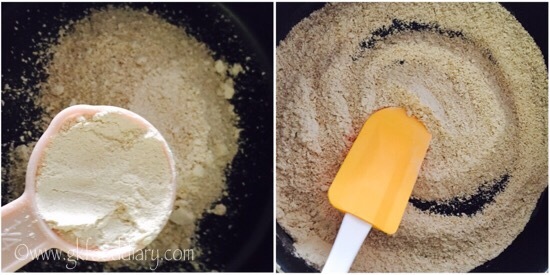 In a mixing bowl, take the grounded oats flour and add 1/4 cup of wheat flour, salt and baking soda to it. Mix well. 3. Then take the butter in a vessel and melt it. Once the butter is meleted, switch off the flame and add vannila essence. Give a quick stir. 4. 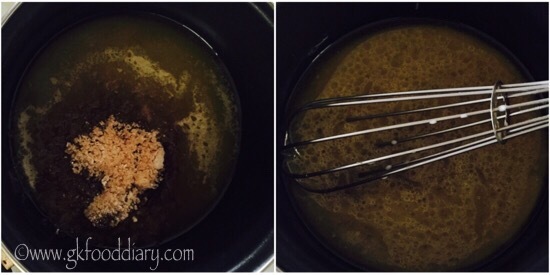 Then add brown sugar to it. Mix well until the sugar is completley melted. Now add the boiled milk and mix it once again. 5. Add this butter sugar mix to the dry ingredients and start to knead the dough with your hands gently. Add chocolate chips and 1 tbsp of wheat flour and continue kneading until you get the sticky dough consistency. 6. Once the sticky dough consistency is reached, keep the cookie dough in refrigerator for 10 mins. In the meantime, line the cookie tray with a cookie sheet/parchment paper. After 10 mins, take the cookie dough from the refrigerator and start making balls and flatten it using your palms. 7. Arrange the cookies and bake in the preheated oven for 25 -30 minutes (baking time depends on the size of the cookies and oven) at 180° C till cookies are browned at the bottom. Allow to cool in tray for 5 minutes and serve the cookies. 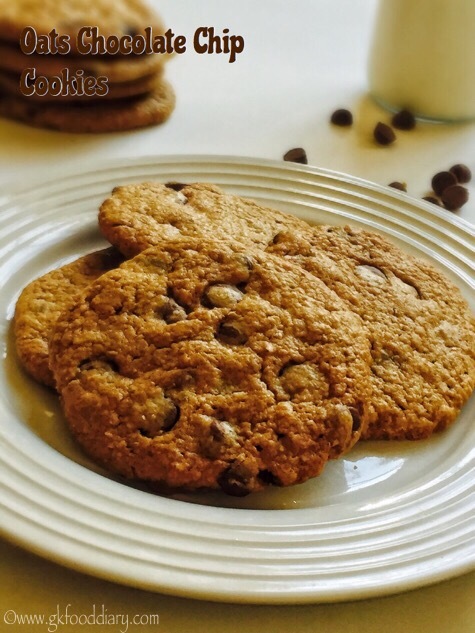 The healthy oats chocolate chip cookies are ready to serve ! Adjust with wheat flour and milk while kneading the dough to reach the sticky dough consistency. To get textured cookies use whole oats instead of oats flour . 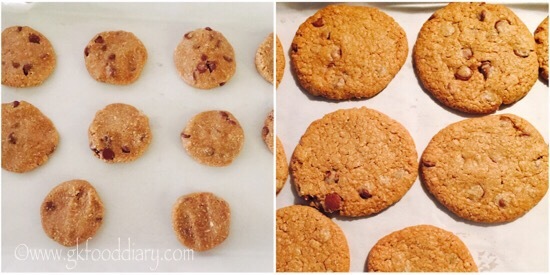 The cookies stays well for a week at room temperature if stored in an airtight container. Keep an eye on the oven after 20 minutes of baking and check cookies turned brown at the bottom though the cookies may look soft. After cooling down the cookies will turn crunchy. 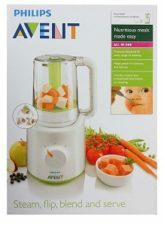 You can even powder the sugar for making the process easy. Mixing and measurements are most important for the perfect cookies. Pls tell me how to measure 3/4th cup and 1/8 tsp.